Nepal’s ruling party merges into super bloc with Maoists - Integration Through Media ....! KATHMANDU: Nepal’s ruling party has merged with a former Maoist rebel group to form a super bloc that experts say will reshape politics after years of turbulence in the Himalayan nation. 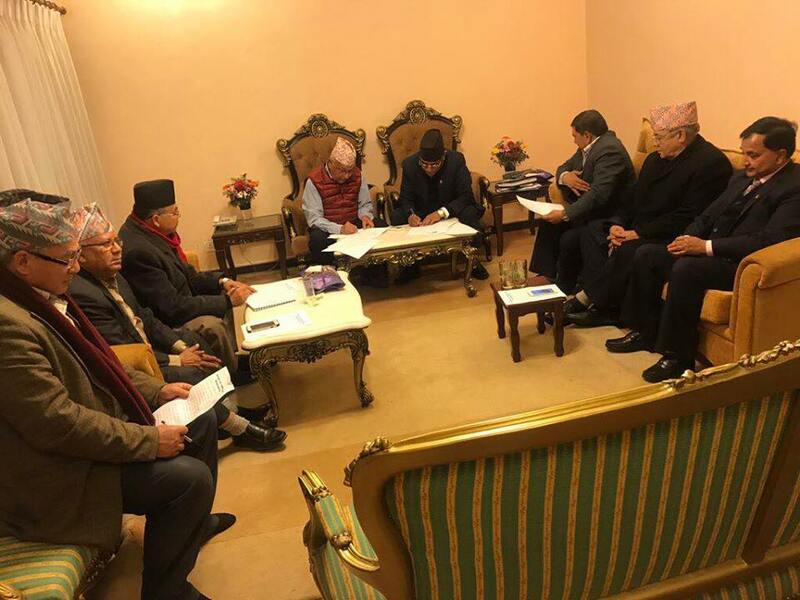 Officials said Tuesday the new alliance, the Nepal Communist Party, was formally signed into agreement following late-night negotiations between the two sides Monday. They forged a political alliance to trounce the incumbent party in last year’s landmark general elections, but this formal merger creates a political behemoth unprecedented in Nepali politics. “This is an agreement to merge, but there are other issues we need to conclude before we completely unify,” senior Maoist leader Narayan Kaji Shrestha told media, adding the transition process was expected to take at least a month. The new alliance commands a large majority in both houses of parliament, and comes just days after Communist leader K.P. Sharma Oli was sworn in as prime minister. Oli’s main Communist party and the Maoists heavily defeated the incumbent Nepali Congress party in polls last year billed as the final step in a post-war transformation to a federal republic. The Maoists, who fought government forces in a bitter civil war that claimed more than 16,000 lives and overthrew Nepal’s 240-year-old Hindu monarchy, dominated politics for more than two decades. The decade-long conflict ended in a 2006 peace deal that saw guerrilla leader Pushpa Kamal Dahal become Nepal’s first post-war prime minister. But their political support has waned in recent years, with their party ranking third in last year’s general elections. Political historian Aditya Adhikari said the merger was a “rare union” between two sides with starkly different backgrounds. The ruling Communist party is older and considered more conservative than its new partners in the Maoists, who have pursued more progressive politics in the post-war era. “If they manage to stick together it will change the future of Nepal’s politics,” said Adhikari, author of “The Bullet and the Ballot Box”, a history of Nepal’s Maoist struggle.